Any medicine is to be avoided unless it is absolutely necessary. If you have any queries please ask your general practitioner or me. As a general rule medical preparations that you can buy ‘over the counter’ (not on prescription) in a pharmacy or supermarket are safe to take in moderation in pregnancy. I do not object to you taking in moderation paracetamol, cough linctus, cough and could medications, antihistamines, lozenges, nose drops, antacids or laxatives. Take the minimum necessary and if unsure contact me or your general practitioner doctor. 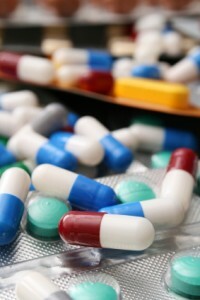 Medicines on prescriptions may or may not be safe. It is important to advise your general practitioner doctor that you are pregnant whenthe script is being written. Any concerns let me know. I woild only give you a script for a medication that will not harm your baby. I suggest you do not ask a pharmacist for advise. They are very very cautious on the whole and usually scare you and advise you against against taking almost any any over the counter medication, even when you are very unwell. Pharmacists are there to full scripts not to play doctor. Fluoride tablets are not normally required in Sydney. See the supplements section of this web site for more information.